Los Suenos sport fishing is where you will find some of the best sport fishing in the world! Here, the water is clear, the seas are calm, and the fish are quite large! Los Suenos Resort and Marina is second-to-none in terms of both inshore and offshore fishing. If you’re a big game fisher, you must experience Los Suenos sport fishing first-hand. 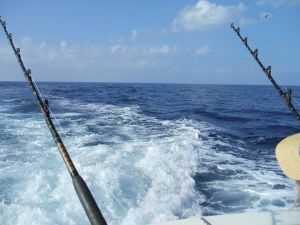 Stay in Costa Rica would like to share a bit about our coveted sport fishing location with you. Costa Rica is home to the largest billfish fishery in the world. In the waters of Los Suenos, it’s typical to pull in between 10-20 billfish a day. No doubt, Costa Rica is a top sport fishing destination, and Los Suenos Resort and Marina is right at the heart of it. If you love sport fishing, your experience is bound to be a memorable one here. At Los Suenos Resort and Marina, we have an extensive charter fleet for sport fishing in style and ultimate luxury. While offshore fishing in Costa Rica is some of the best sport fishing in the world, inshore fishing can be just as good! Our visitors regularly pull in 50+ lb roosterfish and large 40 lb+ dorado inshore as well. For year-round sport fishing, Los Suenos is the premier destination for passionate anglers. As mentioned, the fishing season in Costa Rica goes all year. Peaks for billfish are during the period of December through June (also known as the Tropical Gold Season). Marlin are caught year-round offshore, at the nearby seamounts. It’s not uncommon for fishers to catch 700+ lb marlin. If you come to Los Suenos for sport fishing at the right time, you can take part in our competitive billfish tournaments. Los Suenos Resort and Marina has been hosting billfish tournaments for years. Here, you can find the Superbowl of billfishing competitions – the Los Suenos Signature Triple Crown. This tournament runs from January to March. Only the best sport fishers are allowed to participate in this tournament, as we select the top 50 offshore fishers from around the world. However, Staying Costa Rica has inshore and offshore fishing tournaments throughout the year. Stay in Costa Rica is the place to go for the luxurious getaway of a lifetime and some great sport fishing. We have luxury Los Suenos sport fishing packages that will make your Costa Rica adventure complete. Fishing packages are highly customizable to your needs. Give us a call or send us a message, and we’ll be glad to answer any questions you have. Stay in Costa Rica welcomes you in advance.